Embroidery has been a big trend this past spring and summer, and it will still have a strong presence this fall. I love the feminine feel it adds to an outfit, while providing detailing that is both beautiful and fun. 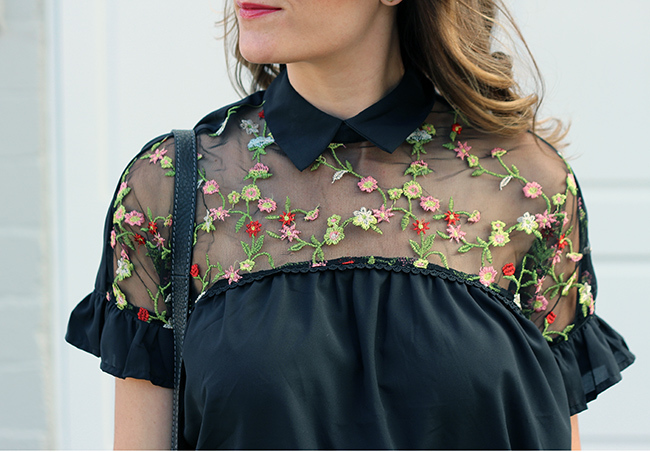 This embroidered and mesh blouse is a recent add my closet, and I have already worn it a handful of times. I dressed it up for a blogging event with black jeans and heels, and have worn it casually with denim shorts and slides. However, my favorite look has been the one I'm sharing today. I noticed that the floral detailing matched perfectly with my rose colored J brand jeans, so I paired them together and love the contrast of the colors. My jeans are by J Brand and a couple of years old, but I did find a few similar options close in color, and linked them below. I added my lace up block heels, Chloé Marcie bag, then finished my look with delicate jewelry. I kept my jewelry simple since this top has a lot of detail, and wanted to keep the embroidery as the focal point. 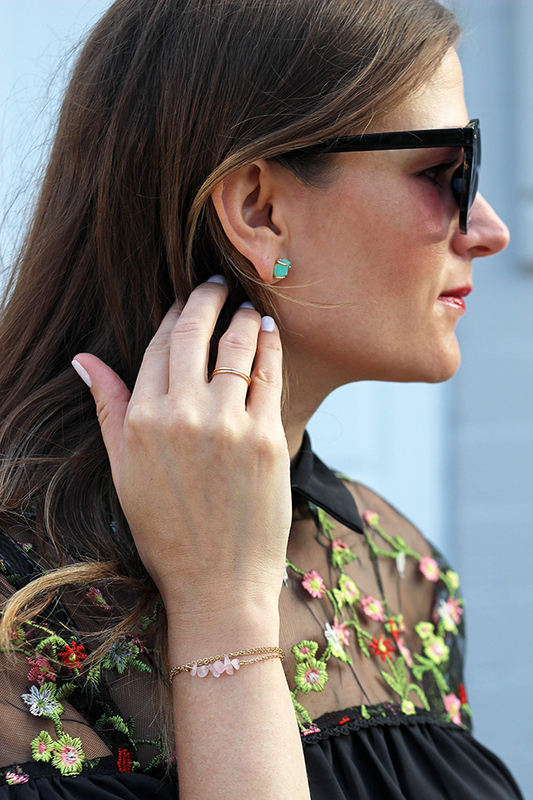 My jewelry is from Charming Charlie, which has become my go-to for finding affordable accessories and jewelry. I recently started shopping there, and love the selection of statement earrings and handbags. I want to thank everyone for your feedback and kind comments on my last post. Your support means so much, and makes every second that I spend working on this blog worth it. I'm excited for what's to come, and ready for the changes that the new season brings along. what, this top comes in black?? I just ordered the white this week and was thinking I want this in black but settled for white lol! Love it! Love this top! The collar is such a fun detail! I have loved all the embroidery this summer and am excited to continue to wear it this fall! That blouse is beautiful and a great transition piece! Love the shoes, such a pretty top too! Love your mesh top with embroidery. Great style babe! Blouse and skinny jeans are perfect! You perfectly pulled this look together. You look beautiful and I love the shade of pants! This is one of my favorite outfits on you EVER! Love the top!! This blouse is so beautiful. That blouse is amazing and so are youre shoes! I can't get over those earrings. They're dainty but they pop even from a distance. Great outfit! The look is so beautiful and sophisticated. I love embroidered clothing. That shirt is SO pretty! Love it! What a pretty top! I'm loving the color of those pants, too. Super cute! This top is so so gorgeous! I love how you paired it with the blush pants. I think it matches so nicely and makes for a gorgeous end of summer outfit! I'm really considering purchasing this top now! The sheer neckline with embroidery is so fun in contrast to the opaque rest of the bodice! I love the heels you paired with it. They go brilliantly with the top, and the pants are a great pop of color! Such a fun end-of-summer/early fall look. Ok, that blouse is EVERYTHING!!! I love the earrings too! The embroidery on this top is so cute! It definitely makes the whole look! I just got a similar dress from ZARA and I am obsessed! Love this top for the transition into fall! Love that blouse and the bracelet! Charming Charlie is sooo good! What a gorgeous top! Love embroidery! I love anything embroidered! How stunning! I love colored floral prints on black dress. Also, those shoes are really adorable. You're looking really pretty dear.